As a young, Jewish, lifelong Republican, who is a Ron Paul supporter but will happily vote for Romney in the fall, I disagree with many of the things you said. I do however feel that it was brave to put out the 'Chaos Slate' flier. I agree that Pat was wrong to condemn the flier unless he would also condemn the boos for Israel and party unity. Standing up against all 3 would be a principled stand for unity, what he did was pandering. I feel that Ron Paul brought many people to the Republican party who will now be active in the party and supporting our candidates. You are right that many of us will move into leadership positions in the party. I see this as a positive. This influx of young blood into our party will benefit us for decades to come. I'd be happy to write much more, but if I'm going to be ignored, I see no point in doing so. Paul is NOT a Duke admirer. You should check your facts. You claim Bills can't raise the money to take on Klobuchar, but at the same time you characterize Severson as a 'poor fundraiser' and Hegseth as unable to be his own man. Looks to me like the best man won the endorsement. And BTW, raw milk is already legal in MN. This is too funny. Mr. Gilmore, I enjoy reading your stuff. It's very entertaining. I agree with what Moshe says to a point, where I disagree is Chair Shortridge had validity in what he said. Your issue, in my opinion, is while slates were present, the slates were given to one group of people who happened to be in agreement with the slate already. What you did was handed the slate to people that were on your slate. You are certainly entitled to your beliefs and opinions, but the Paul people for the most part, organize with Paul people. Romney with Romney and so on and so forth....my suggestion to you is to bring a bigger delegation and keep your slate to people that are in agreement with your beliefs. I see why the Stubbe photo appeals to you - it's one for the ages. Kubrick would be proud. Thanks for the tip. If I don’t want to become what I hate- then I was thinking today I have to support and work for candidates we’ve endorsed even if I disagree with them or don’t like them…. I don’t like Mitt Romney. I don’t agree with him. I think he is a liar and a disgusting individual, I think that he was sinister and devoid of any ethical compass in how he treated the other candidates in the endorsement battle. Romney brought gay marriage to America, as well as Obama Care. But I suppose I have to help get him elected. We have a whole field of GOP candidates, it seems to me my responsibility would be to help them get elected. I just wonder- why should I work to help get Mitt Romney elected if Republicans in MN are planning, as they’ve already stated, to close their checkbooks and do absolutely nothing to get any of our local candidates elected? Should I just out and out organize a national public campaign against Romney, provide a narrative that will sink him in November? That’s what Republicans are doing right now to our local candidates because they hate them- some of them are Ron Paul Supporters, some of them are too conservative, some of them are avoiding social issues…. Or aren’t Christian enough... whatever the reasons are. I suppose it is an ethical dilemma- to which my answer is, I’m responsible for supporting Romney and RP candidates alike if they are endorsed. It seems the RP haters- I call them haters because they are different than the folks that are upset and disappointed that there weren’t more Romney supporters elected to delegates, or more hard-core Christian Conservatives let through- are insisting that the new crop of delegates work to get Romney elected but have already publicly refused any effort whatsoever to get our local candidates elected…. What should I do I wonder? Does anyone get the tragic comedy of RP types who decry politicians all day long, yet put all their faith in one guy, one messiah, one perfect being...RP. A career (albiet 2nd) politician who isn't really welcome in the libertarian party anymore (why do they bother finding a candidate?..just endorse RP) He's completely infallible...except for the fact he cannot win a single primary election outside of his district...where the only voters (in many cases) and candidates are Republicans! I find it hard to praise Stebbins(she's in my district), nice enough lady but I had to unfollow her after some Facebook sparring with her. She'd just post countless things that led me to conclude I don't need inspired anger in my life, from a supposed ally. It was something about we should primary Rep. Paulsen because of his vote to fund missile defense for Israel and something along the lines of: Who are we to tell other people not to eat cats and dogs? I find it hilarious that you continuously refer to yourself in the third person. Hubris or humility? My wager is on the former, as opposed to the latter. I wonder how long you can grandstand on the premise that not wanting to continue paying for Israeli war materiel somehow constitutes a willingness to kill the Jews. You must have missed it when Benjamin Netanyahu stood on the floor of Congress and told them that Israel can take care of itself. Being of military stock myself, I am inclined to agree with his assessment. Feel free to hide behind "THEY wrote chaos slate," but anyone with a modicum of business sense knows that when YOU sign off on it (especially as noted by the little "paid for by John Gilmore"), the buck stops with YOU. YOU people of the "old guard" are the Vichy Republicans, collaborating with the Demcorats™ on spending bills and bigger, more intrusive government. Well let me tell you what: there will be a liberation, and I for one will stick the future process out for no other reason than to spite the likes of you. mmmm sour grapes taste good, don't they. how does it feel to receive the scorn of an entire delegation? you know it wasn't just Ron Paul people attacking your attempts at division, right? "Will the RPM ever outgrow the baleful influence of the Meeks and Vin Weber and their lackies? One can hope." From your blog in April of last year. Guess what? 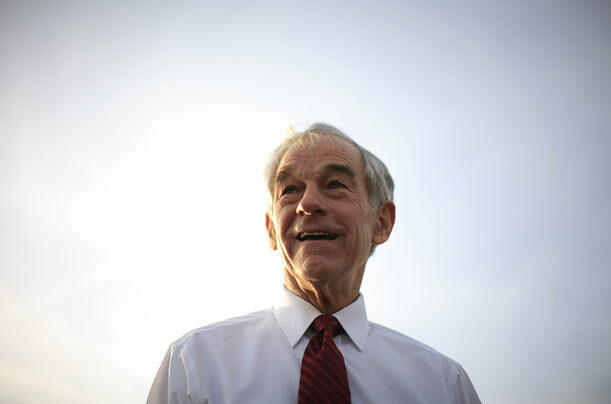 RPM is outgrowing the influence of those groups, and in the form of the Ron Paul movement. I know you may not care for all of its incarnations, but it is about restoring principled Conservatism without the pay to play politics of the past. Our strength is in our principles; that is what motivates the foot soldiers who carry the water for the next generation of elephants. Also, your assertion that Ron Paul or his supporters will help Obama win is patently absurd. Helping Obama win is working for the nomination of someone who is different in as few ways as humanly possible from Obama, with the exception of a small handful of recently changed positions. But yes, even I will vote for Romney if it comes to that. It's notable that the other two senate candidates would not stand on the stage in a show of unity. I don't think I've ever seen that before. One witness said they congratulated Bills privately in the teller room, but you could see they didn't like the way the Ron Paul folks were running the convention. The Ron Paul churlishness extended to denying a delegate spot for our party's deputy chair. Better to vote in people who have done nothing than to vote for someone who has been working night and day to rescue the party from its financial mess! Believe me, elephants never forget. That is the sort of mean spiritedness that will be remembered long after this convention. Can you answer this one: Why do we need our candidate for U.S. Senate going on vacation to Florida for a week in the middle of the Fall election season? Shouldn't he be here trying to get rid of Amy K? Furthermore, why are 40 RP delegates going? Bills is their guy and we are stuck with him. Shouldn't they all be here, busy raising money and calling and working to get their Senate candidate elected? What can they possibly accomplish in Florida that will help our cause here? Finally, in answer to the "Why support Romney" question: We have a binary decision. There will be two candidates for President in November: Obama and Romney. Re-electing Obama would be like the Titanic hitting an iceberg and then backing up and hitting it again. It's not about Romney, it's about getting rid of Obama. Ron Paul will not be on the ballot in November. Or did you miss that little detail? If it's any consolation, my candidate for President won't be on the ballot either. Oh well! I would vote for a stuffed squid before I would vote for Obama. I have 3 family members who are Paul supporters...none of them will support Romney.. The Independence party will be richer this year when all of the Old Guard joins it..
Nobody 'boo's Isrial. We boo'd the obvious anti-semetic shot across the bow. Apparently support for Isrial means continuing to give them our money despite the fact they don't want it while simultaniously funding their enemies at the same time? You are lost in your own world. For the record, I was a State delegate and I read your blog. Anyways, I agree with everything you said except for that Michele Bachman should give up her seat. She may have won it in the next ballot fair and square. For those Ronbots that stick around, it's a lesson in congeniality. A trait which is sorely lacking in many of them. They may win alot of battles but still lose the war, as the saying goes. If anything, the ronbots exposed themselves as the foolish folks they are. I don't even know if they have realized that. I've already addressed the RP phenomenon and, while I hope I am in error, I believe they are a flash in the pan with no long-term purpose but to wreck the GOP as a Party. The Libertarians can't win elections, so turning the GOP into Libertarians is not going to help. Getting 1200 RP supporters to a Convention is a lot different than getting 1.5 million Minnesotans (who think Ron Paul is a kook) to pull the lever for Kurt Bills OR Mitt Romney. Frankly, as Jeff Johnson said, it is up to the RP people to prove that what us "haters" say about you is wrong. Go ahead, prove that you will vote for and work for Republicans up and down the ticket, like them or not. Prove that you are Republicans first and Ron Paul devotees second. Prove to me that Kurt Bills isn't just another "Paul-bot" because, if you can't, he will lose Minnesotans in a landslide. This post is painful to read. Work on your grammar and sentence structure, son. hahaha wow. This article is so stupid. Get this off blogger. Low quality post. Not surprised comments are "author approval only". Libertarians were a core part of the Republican party until the religious zealots took control of the party in the late 70's and 80's - leading up to the Religious Right of the 90's that gave everything over to big business in the name of "God"
How did the Religious Right gain control of the Republican Party? By ousting the existing party office-holders through swamping state conventions and voting their guys in. Now that the Libertarians are doing the same thing to take (back) control of the GOP from the anti-freedom Zealots, they cry foul. Tough luck boys, if you live by the sword, you die by the sword. And to the person who said Ron Paul isn't welcome in the Libertarian Party, you're proving your ignorance. Gary Johnson (the Libertarian Presidential Candidate) has had nothing but positive things to say about RP, endorsed him for the GOP nomination, and has even nodded to RP in his campaign ads. As a political journalist and active delegate I would just like to encourage you to take some classes on writing and find some way to improve your grammar. The article is full of improper usage of words, incomplete sentences and improper references between pronouns and proper nouns. All of this contributes to the articles confusing and inaccurate nature. You seem to have a full vocabulary, or at least the ability to Google search for synonyms to the words you probably originally used, which may explain a few things. That aside the article was not fluid at all and was very 'wordy'. Before posting articles on such hot topics and with such bold claims, please research and proof read your article before posting.